It’s hard to believe that 11 years ago this October, I was a graduate student in Florence, spending one month in Rome, and I started writing about my art and travel experiences online. The ArtTrav domain was registered on November 1, 2004, after a first month on free hosting, and I started handcrafting this website in HTML with frames. Fast forward 11 years – a lot of art, a lot of history, and a career change (from academia to blogging) later and I’m proud to be the writer of one of the oldest art and travel blogs on the internet (unfortunately, this also makes ME old). To celebrate ArtTrav’s 11 years, I’m hosting a month-long giveaway for three art and travel related prizes. Read on to find out more about what you can win and how you can win it. Our very small group tour – Context seminars have a maximum of 6 people in a group! Recently I’ve come to appreciate the utility of taking a good “tour”. Not a “follow the umbrella” tour but a small, private group talk with a really good guide. What changed my opinion of tours is Context Travel, with whom I am proud to be working for the past few months as one of their “Deep Travelers“, a network of about a dozen professional bloggers around the world who share the values of slow, conscious and sustainable travel. Context Travel offers what they call walking seminars, and they are led not by tour guides but by docents, implying a learning experience. These seminars are for people who really want to get a deeper understanding of place and how it connects to the topic studied, be it art, food or history. I’ve taken a Jewish food tour of New York and a Michelangelo Seminar in Florence with them, amongst others. 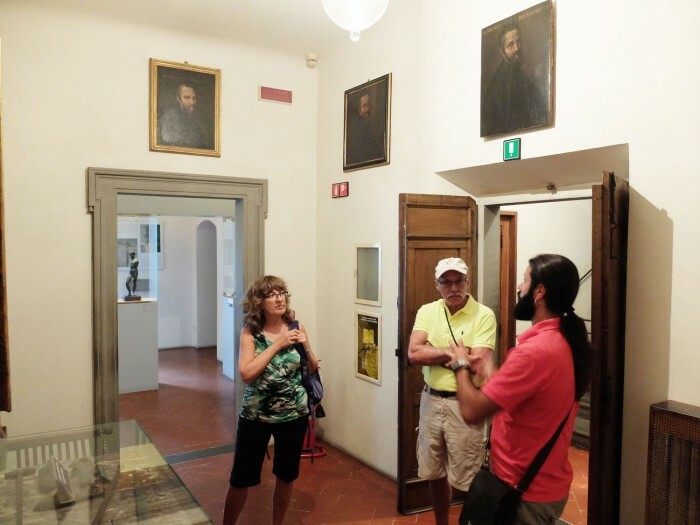 But Context also has private tours specially aimed at children, like the Arte Firenze for Families primer to the Uffizi Gallery, which are so important because they can help kids appreciate art in their formative years. YOU CAN WIN: Context Travel has generously offered two (2) tickets for any regularly scheduled group walk, anywhere in the world (where they operate). To find a confirmed walk, search for your location and date and select the group tour that proposes a date and time. Value €250-300. With Musement, you could book a tour of Venice! Another company I really like is Musement. Musement makes buying museum and tour tickets for your Italy or European trip extremely easy by providing them all in one place. If you’ve ever tried to plan a week in which you need to enter the Uffizi in Florence, the Borghese in Rome, and countless other places, you’ll know how time consuming and annoying it is, with websites that often don’t work properly and way too many receipts to keep track of. I’m not writing ad copy for Musement, I truly believe they can make your life easier. It’s a one-stop, museum shop! Their website and app allow you to reserve all the tickets and tours you want, and pay with just one checkout. Plus, Musement is an Italian start-up, based in Milan, so I’m always happy to support them! YOU CAN WIN: The awesome guys at Musement are giving away a €50 gift certificate to spend on their website for anything you want! (And hey, their listings aren’t limited to Europe, you can even reserve tickets to Disneyland if you want…) Value €50. This prize is really close to my heart. Last year I had the pleasure of editing, but also raising funding for and promoting, a great book about Michelangelo’s David. 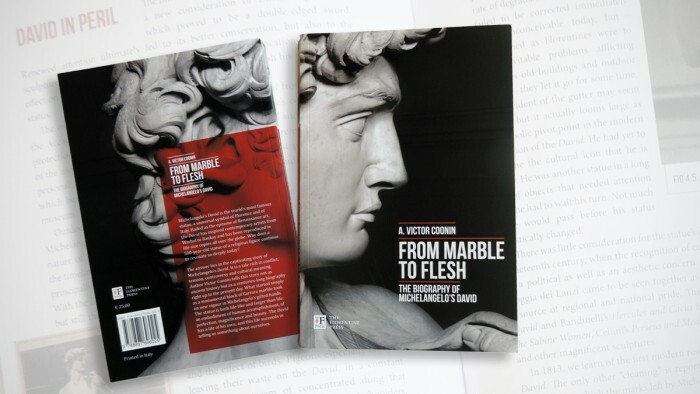 Victor Coonin’s book From Marble to Flesh. The Biography of Michelangelo’s David, published by The Florentine Press, is a truly readable volume that tells the story of this statue as if it were a person who has a life of his own. Not in any fantasy way, but with the perception that he had a “birth” (in the quarry at Fantascritti, near Carrara), an embryonic phase when he was roughed out by an artist before Michelangelo, a birth under the scalpel of the great master, but also a very long life, with numerous interactions with people and places. My favourite part of the book is when the author talks about the sexuality of the David and the way that the work has influenced contemporary artists. The book is a hefty trade paperback printed in full colour, with much love, in Florence, Italy. YOU CAN WIN: I’ve convinced by boss at The Florentine Press (I work at The Florentine and its communications company Flod) to donate a copy of From Marble to Flesh for this giveaway! I will personally take care of shipping it anywhere in the world (though I pray that the winner isn’t in Australia!). Value €25 + shipping. Use the following form to enter to win one of the three prizes listed above. This giveaway is open from October 1 to 31, 2015, from midnight to midnight, EST. RULES: To win, you must enter your name and email address, and follow ArtTrav using the “email newsletter” method to receive new posts by email (you can unsubscribe if you want to at a later date). The other required field is to let me know what post you like best on arttrav (search through 11 years of content and you can find a LOT of stuff!). You can get bonus entries by following arttrav on various social media. I will be using Promosimple’s software to randomly assign the prizes to three winners, who I will contact by email after the draw closes.